As with anything in life, there are proponents of medium roasted coffee and there are proponents of dark roasted coffee. To be able to decide which one you are, you need to understand how coffee is roasted and what happens to the coffee beans, during the roasting process. Green coffee beans are hard, with no aroma or taste. This changes during the roasting process. When roasting coffee, the Barista takes into consideration the temperature, time and changing colour of the beans, to determine whether the coffee has reached it’s optimal roasting profile. The roasting profile differs for coffee beans from different countries of origin. We, at Strictly Coffee, use a drum roaster. The drum roaster consists of a cast iron drum, which rotates above a gas flame. The flame heats up the drum, allowing the tumbling coffee beans to slowly roast, as they come into contact with the metal. When the desired roast has been achieved, the roasted beans are cooled in a cooling hopper, in order to stop the roasting process. Certain changes occur when green beans are roasted. The physical changes to the bean includes the increase in size, the decrease in weight and the oil coming to the surface of the bean. The change in the size and weight of the bean are results of CO2 gas escaping from the roasting bean. The sugars and other carbohydrates caramelize, resulting in coffee oil being produced. This gives the coffee it’s flavour and aroma. The darker the roast, the more does the sugars caramelize, to the point where the coffee taste bitter and the beans are shiny from the oil on the surface. We, at Strictly Coffee, believe that the best way to treat the beans is to medium roast. Another important decision, which the Barista need to take, is whether to blend the green beans before or after roasting. 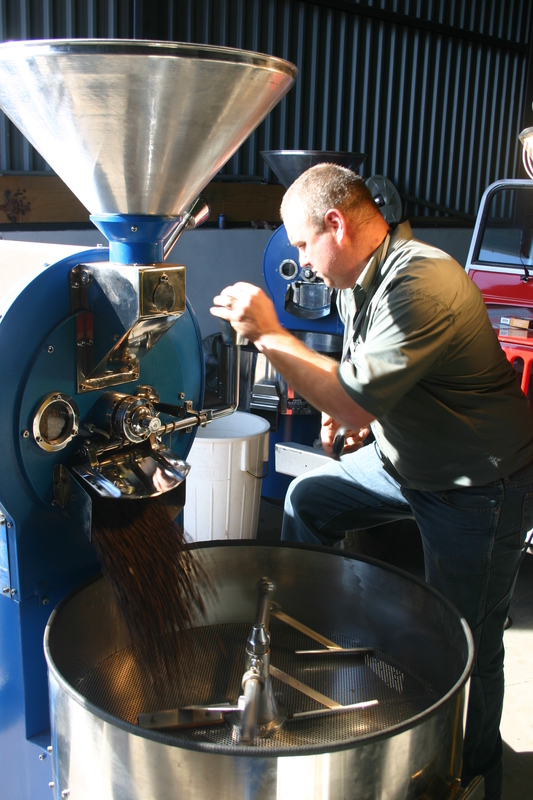 When blending the green beans, before roasting, the different aromas are homogenized during the roasting process. This is a more challenging way to roast, since all the roast profiles of the different origins need to be considered. When blending, after roasting, the different flavour characteristics can be maximized. The Jackson Brown Blend is an example of where the green beans were blended before roasting, resulting in a full bodied coffee, packed with flavour. The Strictly Coffee House Blend is an example of blending after roasting, resulting in a blend with depth. You be the judge whether you prefer medium or dark roast and whether you prefer coffee blended before or after roasting.